The Golden Rams softball team returned home this week, going 4-0 (15-10 overall) with doubleheader wins over Pace University (3-3) and Chestnut Hill College (6-10). 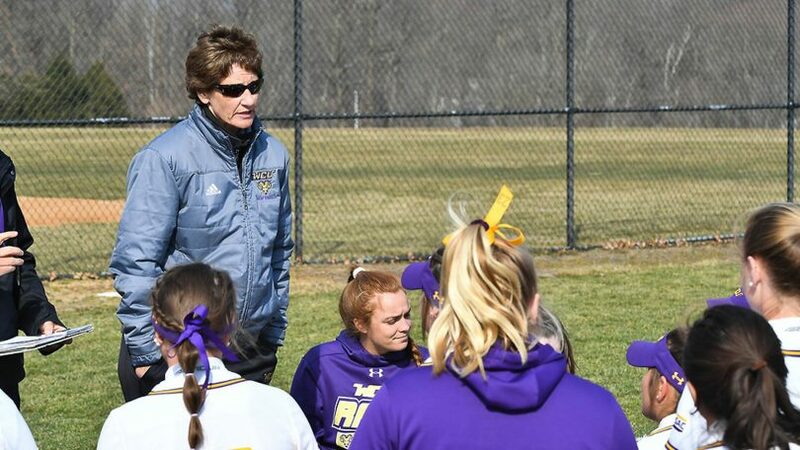 Meanwhile, head coach Diane Lokey eclipsed 500 total wins for her career here at West Chester, and senior Heidi McCollester (West Chester, Pa./Henderson) smacked three home runs Monday against Pace University. Starting off on Monday, the Golden Rams were going in desperate for a pair of wins against Pace University. Led by senior catcher/ first baseman, McCollester (West Chester, Pa./Henderson), West Chester was able to secure both wins in the doubleheader against Pace by winning the first game 10-8 and the second game 6-5. Through both games, McCollester homered three times, bringing her team-leading season total to five and tying her total from last season. McCollester led the team on Monday with six hits and seven RBIs (22 on the season). Coach Diane Lokey was happy with the wins on Monday and was very proud of her senior catcher. Going into Wednesday’s doubleheader, head coach Diane Lokey was in need of only one win to eclipse the 500-win plateau at West Chester. The Golden Rams instead captured a pair of wins defeating Chestnut Hill College (6-10) by a final score of 7-2 in game one and 7-1 in game two. With now over 500 wins as the head coach at West Chester University, and 550 wins overall at the collegiate level, Lokey will look to add on to a historic career as the season unfolds. She will look to players such as Heidi McCollester to help lead West Chester for the rest of the season. After a rocky start, the Golden Rams will look to build some momentum off of their recent wins. With their next two games being here at home, West Chester will look to keep their undefeated home streak alive while they continue to climb the standings.